Although the reception might be considered the most exciting part of your Quince, the Quinceanera Mass is a very spiritual and significant moment in the celebration of becoming a woman. The Quince Mass is a time for you and your family to thank God for the blessing you have received and to celebrate your transition into a Princess of God. Although the Thanksgiving Mass is an important cultural ritual it is not a Catholic sacrament. That means your church may or may not have a specific ceremony they follow, so the task of creating the order of service may be up to you and your family. We've come up with a sample order of service that includes most of the traditional aspects of a Quinceanera. The Quinceanera is escorted down the church aisle by her parents or guardians, followed by her padrinos (godparents or sponsors) and her honor court. The Quinceanera sits or kneels at a place of honor at the altar. Unlike a typical Sunday mass that speaks to the congregation as whole, the Quinceanera Mass reading will be directed to the Quinceaera herself. Popular readings for the Quince Mass center on becoming a woman, everlasting love of God and remaining true to faith against all adversity. The Quinceanera gifts a bouquet of flowers to the Virgin Mary by placing them at her altar. Then in prayer asks the Virgin Mary for guidance and strength in her journey to womanhood. The Quinceanera recites her original baptismal promises and in doing so promises to live out the rest of her life according to the teachings of Christ and the Church. Traditional gifts, such as a bible, rosary, high heel shoes, tiara and scepter, are brought to the altar on pillows and blessed by the priest. Some of these items may be used in ceremonies later during the reception. The Quinceanera may choose to receive Communion from the priest. While she may have received Communion in the past, this one is her first as a woman. 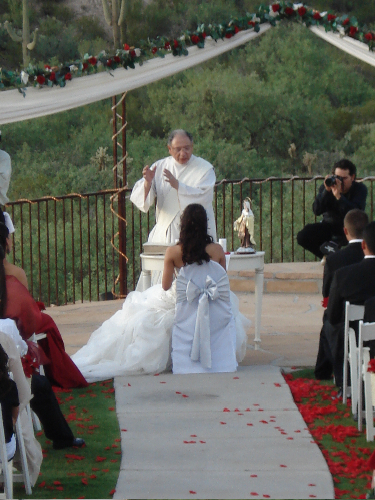 As a conclusion to the ceremony the priest blesses the Quinceanera and presents her to the congregation as a woman. The Quinceanera's chambelan de honor escorts her down the aisle, her parents, padrinos and court follow. Once she has exited the Quinceanera may greet and take photos with her guests.